My latest article for the mBa Banking magazine was recent published. Check it out here! I smiled for two reasons. One, I have very fond memories of my time on Mackinac Island. My honeymoon was the first time that I had traveled north of Grand Rapids up to that point in my life. Because of that, my wife insisted that we go to Traverse City, to Mackinac Island, and that I drive our car both ways over the Bridge … in the outside lane. The other reason I smiled is because my experience with the MBA has increased my ability to travel. Not necessarily all over the world, mind you, but thanks to the MBA I have been able to walk the halls of Congress to press our issues to our federal leaders. I have been able to walk the halls of the State Capitol in Lansing, helping our state leaders understand the reasons why we want them to “Do No Harm” when it comes to public policy and Michigan banks. I have been able to walk the streets of Detroit, Grand Rapids, Kalamazoo, Monroe, Frankenmuth and so many other places with local community banks to share the good work that our members do in revitalizing the communities that we will live and work in. I have returned to Mackinac Island at least 4 times since my honeymoon and each time I walk on the porch of the Grand Hotel. As I look towards the Bridge and the waters of Lake Huron I sometimes shudder at the history surrounding me. 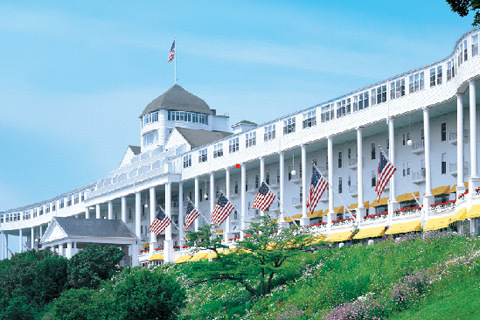 For over 127 years, the MBA has gathers at the Grand Hotel and banking leaders from across the state have witnessed the same view I see each time I’m there. It’s a peaceful view, especially if the Sun shines on the water at a perfect angle. It’s a view that U.S. Presidents have experienced. It’s a view that Michigan Governors have shared. It’s a view the MBA Bankers of the Years have beheld. The power of Mackinac Island, the view from that porch, enhances the vision of our organization. We come to Mackinac every year and we leave empowered to make the changes that our community needs. We come to Mackinac and we empower. We’ve done that for 127 years now. We’re looking forward to having you join us once again on the Island so we all can take in that view.